Even though I have to admit the term “steampunk”, is starting to wear on me, but I do love victorian-esque designs. I find myself shopping steamy websites to appease my urge to party like it’s 1899 and a double thumbs up to Clockwork Couture’s website. This exclusive Posturing Aristocrat Collar by Tatterdemalion Designs made me swoon with delight. I love the ruffled design with the accent buttons! This collar is a versitile piece whether you’re bursting with steam, love the drama of lace and velvet, or enjoy stomping around in post apocoplytic gear. Choice of colors are black or brown, treat yourself and buy both! 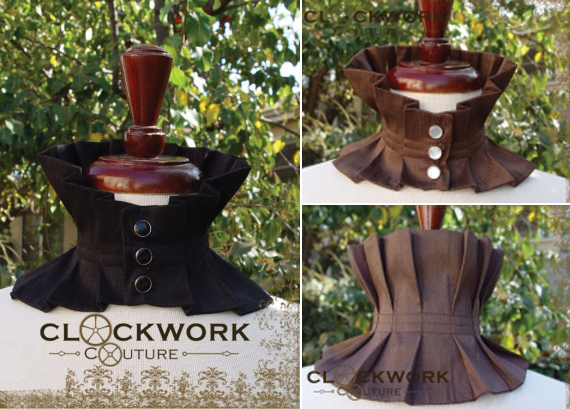 The Posturing Aristocrat Collar is available online at www.clockworkcouture.com. Previous Postthe music videos : 11th hourNext Postfebruary print issues now available! 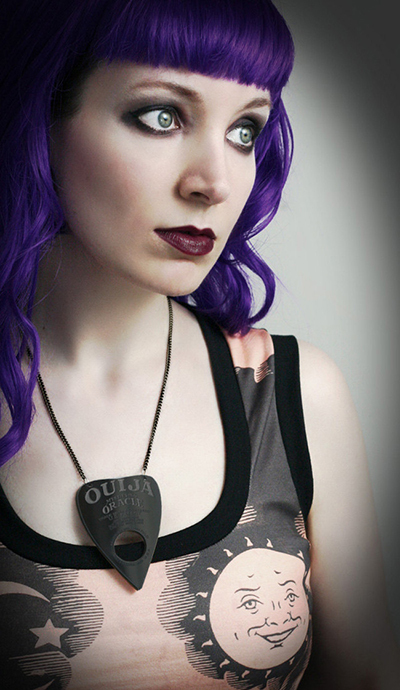 This week’s Item of the Week is the Ouija Planchette Necklace by Smarmy Clothes, a made to order necklace in black acrylic that is creepy cute!